An integrated circuit can be as simple as an oscillator (a thing to make a buzzer buzz) to a whole computer. Each IC is built for a unique purpose, so you can’t just swap one out for another that looks like it. You need to match up the model number that is printed on the back of the package. Before you use an IC, you need to know one thing: If you touch it, you will kill it. Ok, not every time, but a lot of times. These devices are super sensitive to static electricity. If you are all charged up from walking across the carpet (or even moving around in your chair), and you touch an IC, you will blow its mind. Literally. When you are working with IC’s you need to make sure your static electricity is discarded before touching the component. They sell bracelets you can wear with a wire that you clip to a grounded chunk of metal. 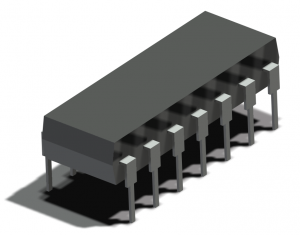 IC packages can be very different depending on the type of project they are going into. If you are going to use an IC on a breadboard, be sure to get the DIP (Dual In-Line Package) style. These will fit onto the breadboard without any trouble.